Home >Comments and Articles > Don't hold your breath waiting for change. I was invited to give the keynote Susan Kronheim Memorial Lecture at the 2004 Undersea & Hyperbaric Medical Society Annual Scientific Meeting on May 28, 2004. This is what I had to say. I'm going to talk this afternoon about medical quackery and alternative medicine. First, though, I need to take some medication. People tell me that I speak quickly, so I am going to take some homeopathic sleeping tablets to slow me down. I'll only take four now, but I might have to take more as the talk goes on. I will have more to say about these tablets later. I'm going to start with a short history lesson for our overseas visitors. On January 26, 1788, this country was claimed for England at a point about two hundred metres from where this hotel stands today. There were three significant scientific matters which contributed to Captain Arthur Phillip being here on that day. The first was the observation of the transit of Venus on June 3, 1769. Captain James Cook had been in Tahiti to record this event, and had then proceeded on a voyage of discovery during which he mapped the two islands of New Zealand and the east coast of Australia. When his ship docked at Batavia (now Jakarta), one third of the crew quickly died of malaria. The second invention was the chronometer (by John Harrison), which allowed Captain Arthur Phillip and his eleven ships and 1,500 people to confidently sail through uncharted seas to reach Botany Bay. The third scientific advance is the most important of all. It was what made it possible for Cook to sail for months in unknown parts of the world, and which allowed the first settlers to make a trip of eight months with such a low death toll. (Of the 1,490 people who set out from Portsmouth, about 40 died on the trip. Six children were born on the way, of which four survived.) The significant event happened in 1747, and it was the invention of the clinical trial by James Lind who used it to conclusively demonstrate the efficacy of citrus juice in the prevention and treatment of scurvy. Before I finish the history lesson, I would like to mention Matthew Flinders. He was the person who gave the name Australia to the island and he and his companion George Bass were the first people to circumnavigate the continent, proving that it is an island. Among the collection of Flinders memorabilia in the New South Wales State Library is a letter from Flinders' wife giving him permission to remarry if she died. The reason that she was worried about dying was that she was pregnant. You might wonder what all this history has to do with the state of quackery in Australia today. One third of the children born on the First Fleet died, and Ann Flinders saw childbirth as a real death threat, but we have active movements in Australia opposing hospital births and even an organisation devoted to stopping Caesarean deliveries. Cook lost 30 out of 90 people to the pestilential disease malaria in 1770 and the smallpox carried by the first settlers devastated the Aboriginal population, but we have an active and virulent anti-vaccination movement who want to take us back to the time before protection against disease was possible. More than 250 years after Lind tested fruit juice, spokespeople for alternative medicine have said that it will bankrupt the industry if they have to test their products or show that they work. The industry claims to be self-regulating, but their idea of regulation is to have no regulation at all. There is an industry body, the Complementary Healthcare Council of Australia (CHC), which is supposed to be part of the regulatory apparatus, but a few examples of its work will reveal the true situation. When Pan Pharmaceuticals was closed down early last year because of bad manufacturing practices, the response of the industry was not to support action to ensure that only quality products were delivered to the public but to lie about the products that Pan made and to lie about what had been recalled. One classic lie was that the product which triggered the action by the Therapeutic Goods Administration was a prescription drug which had nothing to do with natural or alternative medicines. One professional naturopath announced that hyoscine hydrobromide, the active ingredient, was obviously a chemical and appeared nowhere in her professional naturopathy books. It fell to me, a mere quackbuster, to tell her to look under "henbane". That's the factory in the picture, from a 1930 book called "A Modern Herbal" by Mrs M Grieve. When my state government set up a committee in 2002 to investigate the more egregious forms of quackery, the industry response was not to welcome a rooting out of the crooks but to launch immediate ad hominem attacks on anyone who could be identified as having anything to do with the committee. I well remember a post to a Usenet newsgroup with the title "The EVIL workings of Peter B.??". The response united the anti-medicine crowd, with the anti-vaccination liars issuing press releases on behalf of the cancer quacks and live blood analysts and vice versa. I even got mentioned in Parliament! 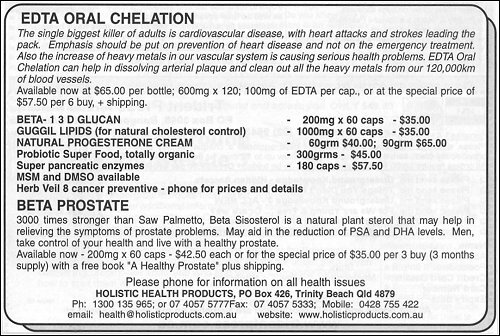 Let's look at some specific examples of quackery available in Australia right now. Zapper - This device I have in my hand cures cancer. If the dial is set at another point, it cures AIDS. There are other settings for other diseases such as multiple sclerosis, diabetes and asthma. This particular device is better value than some others because not only does it beep when it's turned on, but it has a flashing red light to show you that healing is being carried out. It also has an attachment that lets you make your own colloidal silver solution to treat those rare complaints that cannot be cured by zapping alone. You may think that this is nonsense, but according to the people who promote this fraud, that would be because you are doctors who have been brainwashed by your medical training and you don't want your billion dollar cancer racket to be exposed and threatened. 1. Coffea is listed twice among the list of "Active ingredients". I realise that 30C means that there is nothing there at all and the listing is therefore redundant, but why does it need to be listed twice? 2. On your site you mention your good relationship with the TGA. I could not find either an AUST L or AUST R number on the package. Does this mean that the product is not actually medicine and is merely expensive glucose or is the lack of an ARTG number just an oversight? Translated into sense, response 1 says that you can mix two different dilutions of a substance and those different dilutions remain discrete in the final mixture, a fact unknown to most chemists. Response 2 says that the pills don't do anything at all. I should point out that these tablets, which the manufacturer admits are useless, sell for $15.95 for a packet of 80. A packet of 24 brand-name ibuprofen tablets costs $3.89 at my local supermarket. I can see why there is no money for research in alternative medicine. Homeopathic vaccines - This little bottle of water contains what the label describes as a homeopathic vaccine against meningococcal disease. As if that lie is not enough, the label also contains a claim which puts the product in breach of consumer protection and fair trading laws. It says that this preparation is "200C", but if that is the case then the manufacture of this single bottle would have involved 800 manufacturing steps (excluding packaging) and would have produced 495 litres of waste water. (To produce a single year's worth of "vaccine" doses would require 73% of the water needed to produce all of the Coca Cola consumed in Australia in a year.) There is no possibility that this could have been manufactured according to what is on the label, so the people who made it must have deliberately lied. You don't even need science to reject this stuff, but it would help to know that according to the label the amount of active ingredient in this bottle is the same as finding a single molecule of the substance among all of the molecules in 10322 universes the size of the one we live in. One of the myths of alternative medicine is that the potions have no side effects. Of course, anything with effects can have side effects and "the dose makes the poison", but these rules can be ignored in fantasy land. I'm going to illustrate some of the possible side effects by showing how using one alternative product may lead to the need for another. This demonstration is based on three fundamental principles of alternative medicine - free radicals, acidosis and heavy-metal toxicity. But first, I have some extremely bad news for the doctors in the room. One part of this bad news is a book called "The Cure for All Diseases", available at bookshops everywhere. If one book can contain all the cures, including those for cancer and Type I diabetes, then the future of medicine is bleak. The really bad news, though, is specific to the doctors at this conference, because it renders all your expensive compression chambers obsolete. 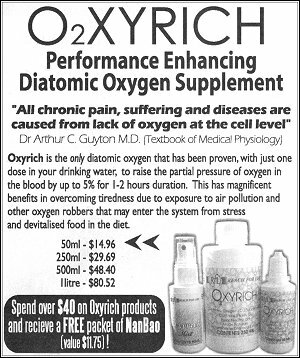 I have here a bottle of Oxyrich, a special water which, as it says on the label, contains a unique oxygen preparation called "pure di-atomic oxygen (O2)". You can see from the advertisement that even small amounts of this wonder product can "raise the partial pressure of oxygen in the blood by up to 5%". This is all available for only $29.69 per bottle, although if you shop around you might be able to get it cheaper. I bought my bottle for only $20, which is a real bargain for 250ml of water. I don't have to tell anyone here about the excellent properties of oxygen. I have been told that cancer cannot grow in the presence of oxygen, which is apparently the reason that you never see cancer on the skin or in the lungs. It's not just di-atomic oxygen which is beneficial, however, because sometimes more is better. The lady who wrote the following letter to an alternative medicine discussion forum on the Internet was advised to try hosing her cervix with ozone, which has been shown to be "almost 100% effective" in the elimination of cancer of the cervix. One problem with too much oxygen in the body (and a worse problem with ozone) is the free radicals which go about oxidising everything and making people grow old (and get cancer). The answer to this is to take an antioxidant, and the best antioxidant is another wonder drug, Vitamin C. This amazing product of nature not only clears up the free radicals, but can cure a huge range of diseases, including, of course, cancer. Unfortunately every piece of silver has a cloudy lining, and Vitamin C brings new problems. It is an acid, ascorbic acid, so it can cause acidosis, which is an increase of acidity in the body. You may think that the body controls blood pH within a very tight range around 7.4, but clever alternative medicine people don't talk about blood pH, they talk about acidity within cells. It would come as no surprise to find that there are many products to treat acidosis. I have another bottle of water here, this one labelled "Unique Water". Its uniqueness comes from it containing magnesium bicarbonate, a chemical compound so rare that it is only about the fourth most common mineral in Australian soils and a major contaminant of ground water. This water must be good, though, because it comes out of a spring in the mountains. I am a bit wary of it, however. I studied chemistry a long time ago, but I was still a bit bemused when I read about this stuff in the paper and one of its inventors said that it increased alkalinity by decreasing the body's pH! I was also a little surprised to read that it was especially efficacious against carbonic acid formed in the cells by inefficient expiration of carbon dioxide. If Mr Hull, my old high school science teacher, was still alive I would ring him up and get him to remind me about how a salt of an acid can be used to neutralise that same acid. I must have been away that day. My biggest concern, however, came when I read that the magnesium bicarbonate in this water bypasses the acidity of the stomach and the molecules pass unchanged through the intestinal wall into the bloodstream, and from there penetrate the walls of every cell in the body. They then are transported into the mitochondria where they do their neutralising work. As each molecule of bicarbonate releases two molecules of carbon dioxide when it meets an acid it doesn't like, I had a vision of my body expanding like a soufflé or gushing foam like a shaken can of beer. It seems that other people were not worried by this possibility, and a recent newspaper article (followed by some judiciously placed television "news" stories) produced sales of about $2 million for this water in a couple of weeks. To avoid the possibility of bodily explosion, I choose to neutralise my acidosis with conventional indigestion tablets like Rennie, but this introduces its own set of problems. These tablets contain calcium and can cause heavy metal poisoning. (Any metal with an atomic weight greater than that of lithium seems to qualify as "heavy" in altworld.) While the most poisonous of heavy metals is mercury from amalgam fillings and vaccines, calcium is a problem as it forms part of the plaques clogging the arteries in atherosclerosis. To get rid of this you need a treatment called "chelation" and the best chelator is ethylenediamine tetra-acetic acid (EDTA). (Yes, it's an acid and could increase acidosis, but some things are a mystery.) I bought a bottle of EDTA tablets and, according to the documentation I received with it, it really is a miracle drug. Not only does it cure a range of diseases (including cancer, of course), but it has to be one of the smartest molecules around. Comparable to the way that a thermos flask intelligently works out whether you want to keep things hot or cold, and like the tableware in the Three Bears' cottage which allows bowls of porridge to cool at different rates, EDTA works out how much calcium you need and either adds some, takes some away or leaves things alone as necessary. The bottle I have does not seem to have the registration number required for therapeutic goods in Australia, but its ingredients do list gingko biloba which I assume is there to help you remember to take your pills. Here is the advertisement that I used to find someone to sell it to me. I'm going to get serious now. This is a perfect example of egregious quackery and the dangers of alternative medicine. I know someone with indolent multiple myeloma. If she were to take these EDTA pills and they did what they are supposed to do she could lose calcium from her bones, increasing the risk of osteoporosis, and the gingko biloba could accentuate the anti-coagulant effect of the warfarin she takes every day. These pills could directly lead to the deaths of people with certain medical conditions. The prostate pills in the same advertisement could indirectly kill people by turning them away from proper medical treatment. In neither case, however, would the death be blamed on the alternative. Both would be seen as failures of conventional medicine. When you are out there talking to you patients and they start asking about alternative medicines, be patient and gentle with them. Remember that they are getting a lot of information from people who believe that black is white, that up is down, and that for some time today it was Tuesday instead of Friday. The state of quackery in Australia is far worse than it should be, but that doesn't mean that things are hopeless. There are people and organisations, like the Australian Council Against Health Fraud, working to bring sense to the situation. Resistance is not futile, and while the flag might be upside-down, it isn't white. Just don't hold your breath waiting for things to change.